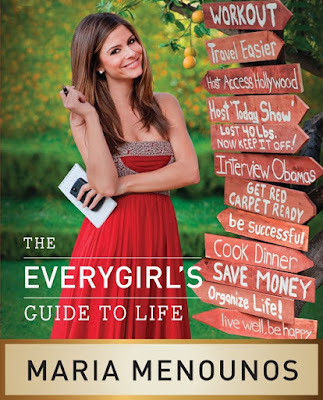 One of the How the Glitz Stole Christmas swap goodies I received from Lindsay (see here) was the EveryGirl's Guide to Life by Maria Menounos. I was excited about the book when I received it because it looked pretty dang interesting, but I never knew just how much I’d enjoy it. I’m like obsessed with it! Maria offers up tips on just about everything you can imagine, from makeup application to organization techniques, to wardrobe selections, to creating worthwhile friendships! My personal faves offered up were her makeup and styling techniques. I’m pretty much an idiot when it comes to them both. I've learned a little bit over the years with the help of some friends, but I’m still pretty clueless when I don’t have their input at my fingertips. Here are few pictures I found of Ms. Lively that I want to replicate at some point. Who would be your celebrity inspiration? I have quite the girl crush on Ms. Blake Lively so totally diggin this post! I need this book, apparently! I'm not sure who my style inspiration would be. I really like Rachel Bilson, but she is so petite and that I am not. I'm on the hunt, now, for my style inspiration. Thanks for sharing! I love Blake besides being gorgeous she has a great body too, I wish my figure looked like hers.